Admission notes: This turtle arrived on January 31 from Satellite Beach. They came in with a large load of barnacles and swelling on the carpace. Narwhal tested positive for Shewanella algae, a bacteria prevalent in marine environments. We are happy to say that since being admitted, Narwhal began eating on their own. February 27, 2019: This morning, Narwhal and four other turtles were transferred to Gumbo Limbo Nature Center at the request of Florida Fish and Wildlife Conservation Commission. With this turtle being cared for at another facility, we will have more room to take in other critical patients. 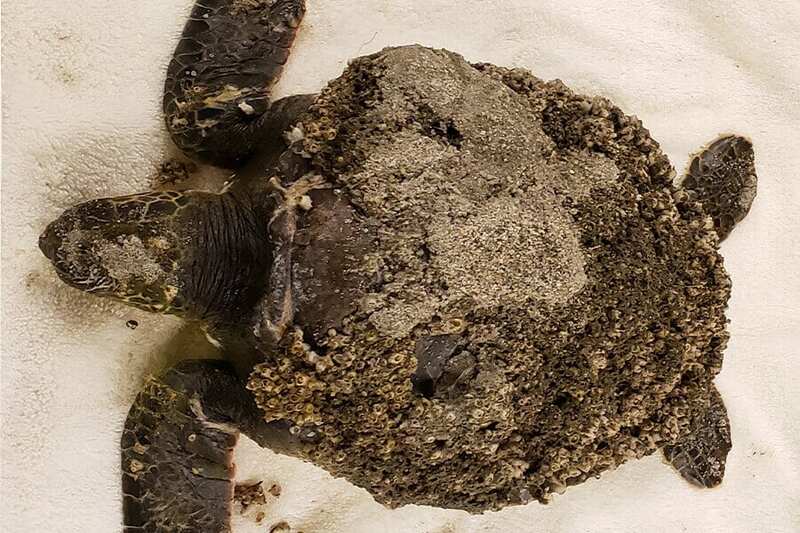 February 21, 2019: Despite coming back positive for Shewanella infection, this turtle continues to eat, be active and stay peppy! Narwhal is due for another blood culture to see if we have made any progress in fighting the Shewanella. February 13, 2019: Narwhal continues to eat on their own and their carpace is starting to heal up.